Archie Comics is known for some of its characters, many of whom have what you would call "longevity." Archie, Jughead, Betty and Veronica, Josey and the Pussycats and Sabrina the Teenage Witch are all pretty recognizable and offer a lesson in maintaining relevance. Still, characters with such extensive backgrounds bring with them equally as extensive baggage so to speak, so it's a good thing every now and then to hit the reset button. Archie Comics is doing just that in a big way, as Archie #1 will boast the talents of Mark Waid and Fiona Staples when it launches next year. Waid, no stranger to major comic book storylines – having penned DC’s Kingdom Come, often cited as one of the best comic series in history among many sterling credits – will bring his knack for reinvigorating long-running properties to create a comic that not only presents Archie and his friends squarely in the present, but also turns up the humor. The story will get its visual personality from the unique direction and presentation of Staples, the artist on the perennial bestseller and critical darling comic series Saga. The groundbreaking relaunch kicks off a bold and multi-platform celebration of 75 years of Archie starting in the latter half of 2015 and rolling through the anniversary year of 2016. The “Archie 75” celebration will start with Riverdale a one-hour drama written by Archie Comics Chief Creative Officer Roberto Aguirre-Sacasa based on the iconic Archie comic book characters will debut on Fox, produced in tandem with Warner Brothers Studios and studio-based Berlanti Productions. 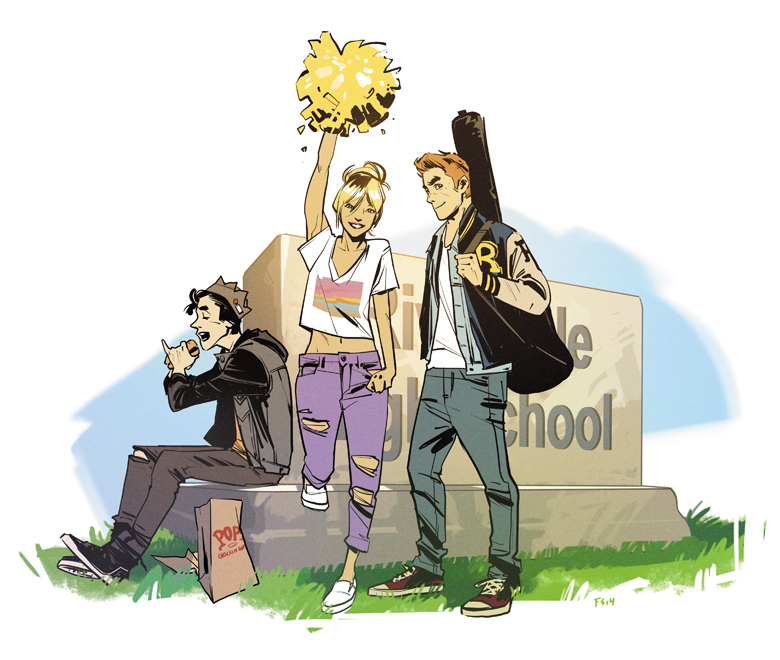 Set in the present, the series offers a bold, subversive take on Archie, Betty, Veronica and their friends, exploring the surreality of small-town life and the darkness and weirdness bubbling beneath Riverdale’s wholesome facade. Marc Eckō has signed on to design an exclusive line of Archie themed apparel for men, from teens to adults, under the Unlable.ME brand. And finally, a robust and diverse publishing initiative is gearing up that will feature 75th anniversary-themed periodical, graphic novel, digital and specialty product geared toward new and longtime fans. Editorially, fans can expect to see a targeted digest program retaining the “classic” Archie look and style and the expansion of the world being built in the new Archie series via additional ongoing titles.